The first time I encountered a Manta face to face many years ago, I couldn’t stop grinning all day. There is something magical about these big creatures, the calm ways they move underwater, fully aware of their surroundings. They could glide over you just inches above your head and still manage to avoid touching you. Here’s a clip of me chasing a Manta for over 3 minutes, and I’m going to show you how. OK, I lied. Yes, I kept up with the Manta for over 3 minutes, but it was at the expense of great effort and I won’t recommend it! The Manta was just gently gliding along while I was finning furiously. This article isn’t about how to chase Mantas at all; instead, I wanted to share with you 6 tips on how to see and get close to Mantas. While diving, look up often. I’ve heard numerous stories where the boatman, while waiting for the divers below, spotted Mantas near the surface. But when the boatman asks the divers about it after their dive, none of them saw it because they were so focused on looking downwards and towards the edge of the reef they totally missed the Mantas above them. Such lost opportunities! You won’t be able to keep up with a Manta, and if you were taking pictures, you will only end up with pictures of its rear end. Chasing Mantas is also the quickest way to make them disappear into the blue, and ruining the experience for every other diver in your group. This is what happens when you try to chase one. The most common side effect from this is the signaling of “Low on Air” to the Divemaster shortly after. p.s. For my own safety, the diver in this video, although known to our group, will remain nameless. And yes, the side effect happened. In the diver’s defense, the diver was only recently certified, so no one in our group blames or holds a grudge against the diver for the enthusiasm. Just like us, Mantas are curious too. If you move slowly or keep still, very likely these Mantas will come near to have a look. They might even be wondering why our heads are leaking air underwater. If they are being cleaned by reef-dwelling cleaner fish at a cleaning station, moving slowly to avoid startling them will give you chance to view them up close. Sometimes, a Manta will glide past, at first further away, then circle round and glide past again but nearer to you to have a look. If you are lucky, it will keep circling, coming nearer to you until it is above your head before disappearing off into the blue. In my experience, all sightings of Mantas have been in waters with mild to strong currents. So, moving slowly or trying to keep still may be difficult. This is when a reef hook comes in handy to secure yourself. If you happen to be on sandy bottom, then secure the pointer into the sand and hook yourself to the pointer. Before the dive, making sure everyone in your group is aware of what to do when encountering Mantas will make the encounter so much more enjoyable. Usually, your Divemaster will brief the group on what to do. But in case your Divemaster forgets, ask the Divemaster what to do for the benefit of everyone in the group. This is especially for those of us who are photographers or videographers. Too often we are so focused on trying to get that perfect shot we forget to just put aside our recording equipment and just enjoy the moment. 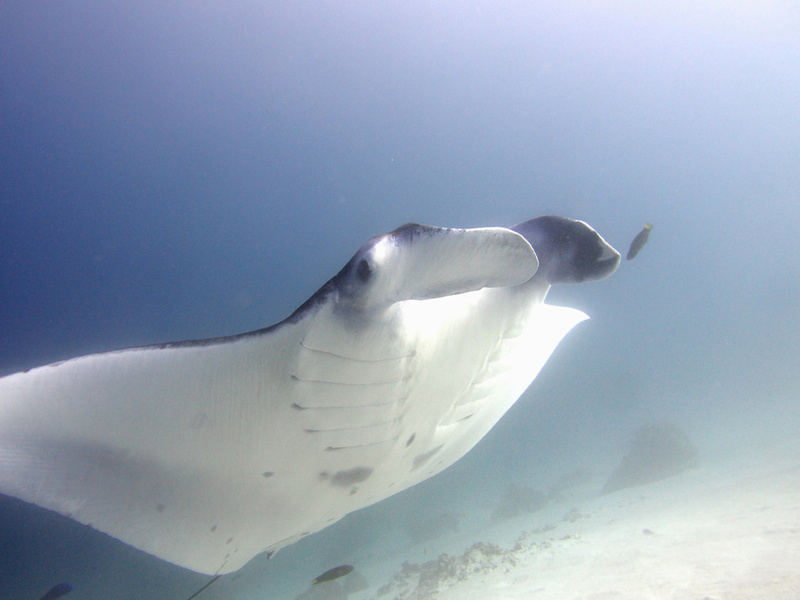 Even after all my encounters with Mantas, I am still awed whenever I see one on a dive. Mantas are usually seen at a certain time of the year. Although there is no guarantee that you will see Mantas on your dive, the best chance for you to see them is by having a longer dive trip so you can visit the location multiple times, and also to choose the best time of the year they are spotted often. Here are the best times to see Mantas in various destinations. Raja Ampat, Indonesia – Can be spotted all year round, but best time is October to June. Sangalaki Island, Indonesia – Can be spotted all year round, more frequently between November and January. Previous articleRobert Lo’s Mabul Water Bungalows House Reef – Artificially Awesome!